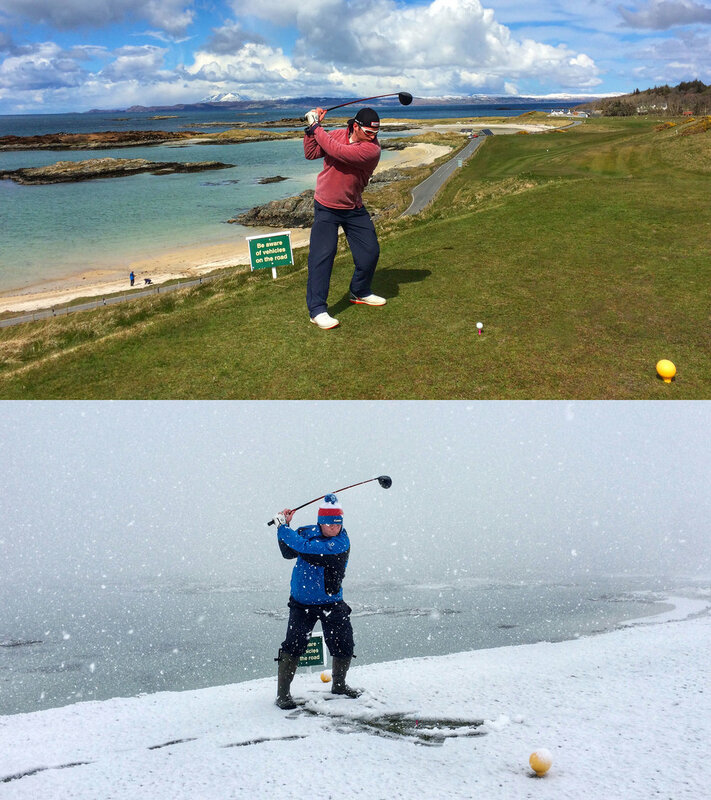 The two photographs (attached and below) were taken 24 hours apart by one of our members, Matthew Waterston. 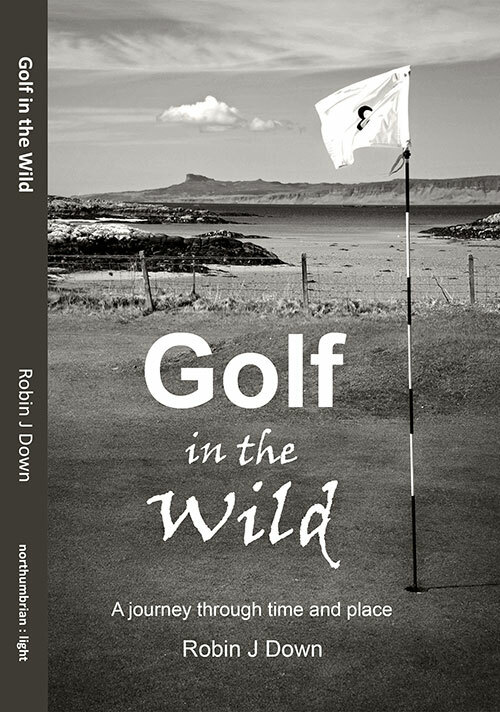 Robin Down has written Golf in the Wild, a book about some of the fabulous remote and undiscovered nine hole courses from the Borders to the Scottish Highlands. It does of course include Traigh. Of course we are biased at Traigh as our own course features on the cover, but we loved this book by Robin Down - I can only describe it as a cross between Bernard Darwin, Kate Atkinson and Jeremy Clarkson if such a thing can be imagined. A wonderful picaresque golfing tour through the loveliest parts of Northumberland, the Borders and the Highlands. By turns entertaining, funny and moving, it is a book whose scope ranges from the challenges of blind shots over dunes and through trees, the high-handicap frustrations of short putts and long irons, the heroic days of Formula One in the 60s and 70s, the ferocity of a mother-son relationship in another age and of course all the beautiful nine hole golf courses the author wove into the tapestry of his tale. Sinkhole News - Repairs are now complete! 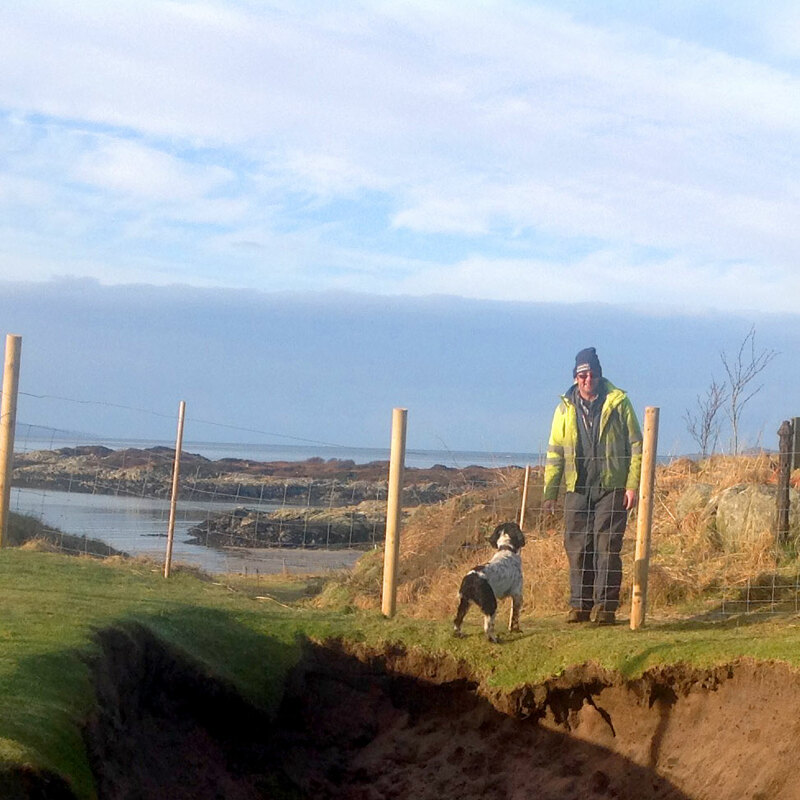 Traigh Golf Course – one of the most scenic in Scotland - is delighted to announce that the 12 foot deep sinkhole, which appeared overnight last November as a result of a collapsed drain in torrential storms, has now been fully repaired. The replacement turf is now well-established and a new grass bunker has been added next to the seventh green – albeit it is considerably smaller than the original sinkhole! The seventh hole is going to be formally reopened on Saturday 1st August, the day of the Traigh Open competition. As a bit of fun, the hole has been renamed 'The Sinkhole' and 'An Sloc' following the tradition of naming the holes in both English and Gaelic. Roddie Burgess, Captain of Traigh Golf Club says, "I am absolutely delighted that we are back in business so quickly. The damage to the course seemed devastating at the time, and I can think of easier ways to get all the publicity that we received earlier in the year. But we felt that it would be appropriate to preserve the memory of the sinkhole – though we certainly don't want to see it back again! The Open is always a special day in our calendar and this will be particularly so." David Shaw Stewart, one of the owners of the course, added that "We are hugely grateful to the local firm Corrie Construction, with the able assistance of our own greenkeeper Gavin Johnston, for their sterling work in repairing all the damage. They were working through rain and snow in the middle of February and they certainly had to face some tricky technical problems. They threaded a new plastic pipe through the remains of the old metal pipe laid in the 1970s but they had to be very careful not to damage the high pressure water mains pipe that runs through the golf course. It cost us over £10,000 but as we said at the time we are passionate about the course and determined to keep it going." Golf has been played on the spectacular Traigh Course for over 100 years. Originally the course was very simple, but it was enlarged and extended following a plan devised by the famous golf architect John Salvesen for the late owner Jack Shaw Stewart in the early 1990s. It is the most Westerly golf course on the British mainland, and one of the most beautiful. On a clear day you can see not only the isles of Skye, Rum, Eigg and Muck, but even the peaks of South Uist just showing on the horizon to the North West. 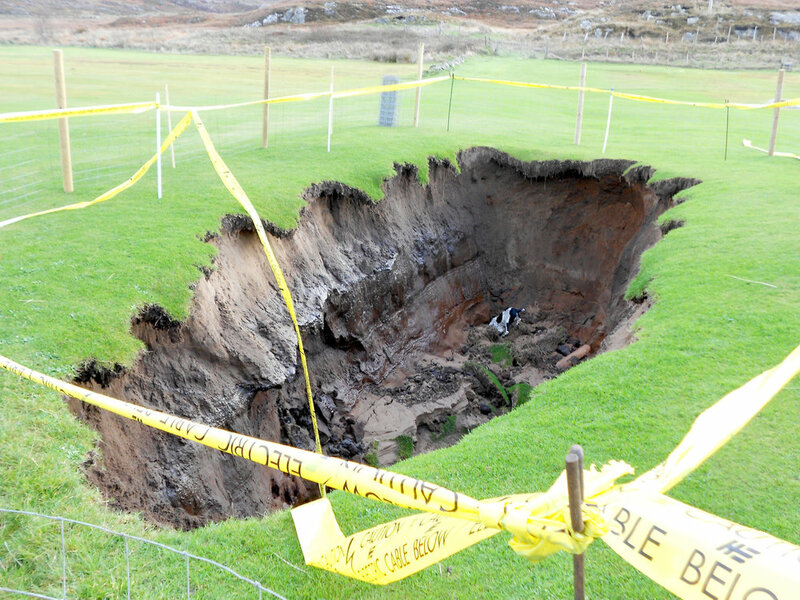 On the night of the 27th of October 2014, after three days of very heavy rain, the ground gave way on the 7th fairway, and a large sink-hole appeared on the near the green. The hole was roughly seven meters long, four meters wide, and four meters deep. Gavin Johnstone, our green-keeper, was the first on the scene: “I couldn’t believe the size of the hole that appeared in just one night. The run-off from all the rain we had shifted about 200 tons of sand and peat, and dumped it on the beach”. He felt a little bit nervous when his dog Corrie jumped into the hole – Corrie seemed to be trying to figure out what kind of rabbit had made this extra-large burrow. “I just hoped he wasn’t going to get stuck – because I would have had to go into that hole to fetch him out”. It turned out that a drainage pipe had been unable to cope with the exceptional rainfall of the previous few days, which had swept away the sandy soil. The good news is that we're all set to replace the drainage pipe as soon as the weather clears. The modern plasic pipe will be installed at a very deep level in order to take water from the back of the course to the sea and the course will be back at its best once we have done so. We are passionate about the course, which we believe is an important facility for both local and country members of the golf club and for the many visitors who play it in the summer. But we find once people have played here they always want to come back, there can be few golfing experiences anywhere in the world to compare with teeing off on the ninth towards Eigg on a golden summer day.